The elk (Cervus canadensis) is one of the largest species within the deer family, and one of the largest terrestrial mammals in North America. Female elk (called cows) average 496 to 531 lb, stand 4.3 ft at the shoulder, and are 6.9 ft from nose to tail. 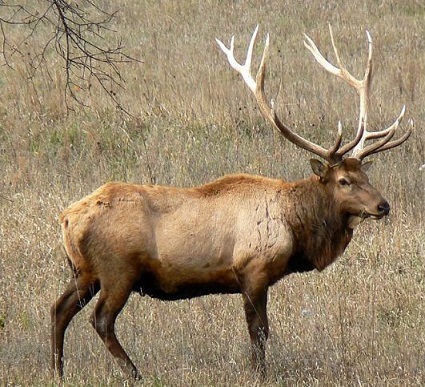 Male elk (bulls) are 40% larger than cows at maturity, weighing an average of 705 to 730 lb, standing 4.9 ft at the shoulder and averaging 8.0 ft in length. During the fall, elk grow a thicker coat of hair, which helps to insulate them during the winter. Needless to say, wild elk avoid humans, especially hunters. The Eagles Nest Wilderness area in Colorado’s Rocky Mountain National Forest is prone to sudden, unpredictable and drastic changes in weather. In 1992, Derek Patton and his youngest son Ryan were hunting in Eagles Nest when the two got separated. Derek got a search and rescue party to search for the boy, but in vain. Then it began to snow. The rescue party had to call off their search when night fell. The boy, dressed in summer clothes, would surely die from hypothermia. The next morning, they resumed their search. The rescue dog found Ryan, who was on the verge of hypothermia. The boy told an amazing story — that he had sought shelter under the low-hanging branches of a fir tree when two large elks approached. Ryan twice tried to shoo the elks away, but the elks persisted, each time getting closer to Ryan. Finally, Ryan gave up, and the two elks lied down next to Ryan throughout the night, shielding him from the cold with their body heat. In the morning, the elks left. I sure hope Derek and Ryan Patton stopped hunting after this miraculous display of altruism by the two elks. 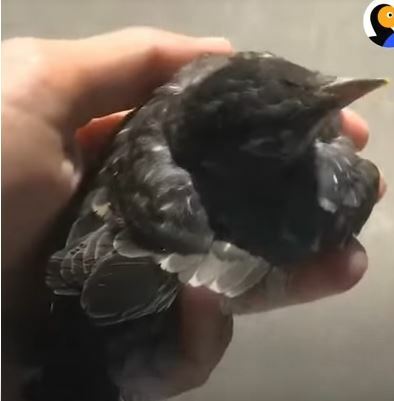 Kara Twomey was walking her dog and saw a crow grabbing and flying off with a baby robin. But the crow dropped the robin, so Kara rescued the fledgling and took him into her home. Kara named the robin Squeaker, and nursed him back to health. Little Squeaker began to hop around, then flew. Kara kept Squeaker in her back yard, and Squeaker would come to her, stand on her shoulder or head. Then Kara released Squeaker “into the wild”. A month later, Squeaker returned to visit Kara. The dictionary defines the adjective “kind” as being generous, helpful, and caring. Isn’t that what the second greatest commandment’s “love your neighbor as yourself” means? When was the last time you were kind — generous, helpful and caring — to someone in need? And when was the last time someone was kind — generous, helpful and caring — to you? And may the peace and love and kindness of our Lord Jesus Christ be with you! Studies show doing good deeds is good for our health!